Overhead garage door repair, can you develop the skills you need? Garage doors are the biggest heaviest doors in any home. No surprise that they often need attention. 'Adjusting a Garage Door', 'Garage Door Spring Repair', 'Garage Door Opener Problems', 'Weatherstripping for Garage Doors', 'Garage Door Hinges', 'Garage Door Rollers'. Follow these links for more information and instructions. They also have the most moving parts. Parts can wear out or break, things can get out of alignment. All it takes is one item that is not working and the whole door can be rendered useless. The garage door springs do the heavy lifting. When the door is down they are stretched. When you lift the door, the springs recoil and lift the weight of the door for you. The door follows tracks and uses rollers to stay in place. The moving parts need to be lubricated and and the tracks need to stay in alignment. There are also hinges that hold the panels together. If any of these items fail, you will need to make an overhead garage door repair. You can get the know how, to repair garage doors without too much difficulty. Read on. Below you will find some common problems that you might encounter with your garage door. There is a brief description and a link that will lead you to additional information on garage doors and the related repair issues. Our evaluation sections of the pages will help you to decide if you want to make the repair. The "What Can You Save? "and "How Hard Could It Be?" sections give you a quick overview of the repair. After you have reviewed this section, you can decide if it makes sense for you to attempt your own 'Overhead Garage Door Repair'. The "Check the Simple Things First" section will clue you in to easy fixes to check for. Garage doors, like other household items have simple things that break or quit working properly. Many times something easy will eliminate a problem without the aggravation of an involved repair. In an effort to warn you about what you are in for, there is the "What Can Go Wrong" section. Forewarned is forearmed as they say. Knowing what to watch out for is always helpful. Below you will find brief descriptions of the issues you may have run into. Click the link for the related article to find out more information. The springs are the workhorse of your garage door. Over time, metal fatigue can cause them to break. With a broken spring the door is very difficult if not impossible to lift. For broken springs you will need to replace them. See 'Replacing Garage Door Springs', for more information. The quality of the springs can vary and the difficulty level changes with the type. You may not want to tackle this repair, but understanding what you will need will allow you to hire someone at a reasonable cost. Your garage door spring problem might be an adjustment issue. It could be very simple. Take a look at 'Adjusting Garage Door Springs' for more information. When the door is out of alignment it can bind and not work correctly. 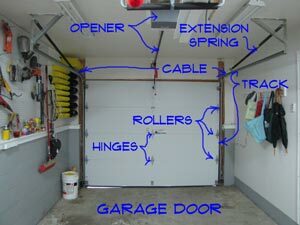 Adjusting the garage door may be an inexpensive solution to your problem. Before you call the repairman, find out if an adjustment is all you need.Find out what you can to adjust the door without doing a complete overhaul. The garage door rollers allow the door to move up and down in the track. They can break or seize up. You can either lubricate them or replace them as needed. Replacing them is not that hard, they are less than five dollars. Ten minutes and you're done. Use this link to find out everything you could possibly want to know about garage door rollers. There is really not that much to know, but it sounds good. The garage door hinges are used to allow the door panels to move independently of each other. On the sides of the door, they have a sleeve for the rollers built into them. Hinges can rust, seize up or break. This is also an inexpensive and simple repair. Learn the secrets about garage door hinges that have been passed down through the centuries via a secret code. No, not really, they are pretty easy click the link above for more information. With a garage door opener, you have no lifting at all, just push a button. It does not eliminate the need for springs. It has moving parts and is also an electrical device. A garage door opener is one of those things that can have some simple problems that cause it not to work. Check out the simple repairs first. Find out what repairs are practical to make by clicking the link above. For an attached garage you want to keep out both cold and heat. The garage door is a big opening. The weatherstripping will cut down on the air leaks and save you money on fuel. Click the link above and check out this topic. We have attempted to provide you with links to the information that you need. Hopefully after examining the specific topics you were able to determine if you want to make your own overhead garage door repair. Many of the repairs are practical for the average homeowner.